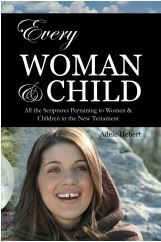 From the Author: It is not very often that I come across a woman that the Lord has led down the same educational path as me. What a blessing it was to be able to correspond with Adele and learn that she has studied many of the same scholars’ works that I have. It was as if we had a kindred spirit right out of the gate. When I learned that Adele’s four children were kidnapped by her ex-husband, my heart sank on her behalf. No one can imagine the depth and magnitude of the trauma this causes to a mother. . . except one particular woman of the Bible. Her name was Michal and she was Saul’s daughter. When King David took her from her husband Palti, she already had five children she was raising with her husband. King David took her from her husband, who loved her deeply, and her children. That is why she despised David and never had any children with him. (Read the account of this story here: Another Twist of Scripture to Subjugate Women to Abusive Husbands) And yet, this story has been used to subjugate women to abusive husbands. When I was growing up (Catholic), we were taught to sit and be silent, and no chewing gum. I don’t remember a thing the priests ever said. As a teenager I decided I didn’t want to go anymore. There was never any communication about God, no bibles in the house, no talk about why anyone went to church. It just happened. When I got married I thought it was a good idea to go to church occasionally. I can’t honestly say I learned anything from the sermons in those years either. It was all empty talk. They only have a few minutes to give a sermon yet they seemed quite happy to pass the time expressing how the Smiths came back from Hawaii, or that the Jones got their new boat, or that their favorite hockey team won last night. When I had my second child I was so happy and wanted an announcement to be put in the bulletin, but they told me, “only if it gets baptized,” yet trivial stuff was in there like building fund, puzzles, birthdays, jokes. It seemed like every Mother’s Day was marked for a sermon about submission. One year the ex beast came and as soon as we got back into the car, he said, “ya, the priest said a woman is supposed to submit to her husband.” Thankfully, I had a swift comeback, “that’s right, and the husband is supposed to die for the wife.” I was disgusted with that priest, for setting women up for abuse. Religion definitely influenced my marriage. My marriage was ugly but my divorce was hell. The ex beast finally kidnapped all four of my children, 900 kms away. After that I was completely ostracized. No one wanted to associate with a wailing, grieving mother who lost her kids. I was so devastated that it is amazing I am here today. After losing my children I was in a constant state of sadness and depression. I had no purpose in life. Going to church got to be more frustrating as time went on. I had even stopped reading the bible. …Then I happened to find an old book in the back of a church that was about to be thrown away. It was “God’s Word to Women” written by Katharine Bushnell in 1923. That book changed my life. I devoured her book and knew she was right about the mistranslations and the misinterpretations of the women stories in the bibles. She found many errors in ancient manuscripts, almost always against the women. For years I compared bibles and found that Katharine was right. I was disgusted with all the patriarchal churches. When I think back about all the priests / pastors in my life… one tried to feel me up when I went to confession, one new priest wouldn’t let me get my Christmas lights from the storage room (and I used to be in charge of so many things there), and, after months, he finally appointed a man to unlock the door, and they had been stolen. Another priest, when I asked him a question, gave me some fancy warning about not taking the bible literally and that people have to study it for years to be able to understand it. So I went to a seminary to take a course and when the story came up about men not wanting the children to get close to Jesus, the priest professor said it was because children have snotty noses, and they are always crying and sneezing and dirty… and I was pregnant and was mortified. I was deeply wounded; my Jesus wouldn’t think that way. One Baptist church was disturbed about an unwed pregnant woman, and wanted her to come to a meeting alone, without her fiancé, to be questioned and chastised by all the male elders; her parents said they would leave the church if they pushed it, so they dropped the meeting. The priest who married me and the ex beast left the room so we could listen to some premarital tapes; the ex beast fell asleep, and when the priest came back wanting to discuss the tape, the ex beast and him had a grand old conversation about all their travels and I was left in the dust. I later found out he tried to hit on my cousin, and had many convinced that he needed a housekeeper and a house! . . .and the people supported him! More than one bible study turned bad because I asked too many questions or gave too many answers. One bible study leader wouldn’t even tell me where the next bible study was, or what it was all about, and he had been leading it for 3 weeks already. Another used the Timothy silent verse to shut me up, and when he read the words from his bible, I asked him if those were God’s words or man’s? He had to admit they came from the margin. Needless to say, I was not invited next time. I found pastor’s wives to be jealous if I tried to talk to their husbands. I found arrogant men trying to make fun of what I said, even when it was very profound. I found little support from the people who went to church; they were uneducated and afraid. One friend was raped by the pastor when she was a girl; her mother sold her to the members of the church; but no one wants to talk about it, still to this day. Most priests / pastors do not do any homework for their sermons. Some yell their heads off and say they are anointed (that’s when I leave). What I have learned has been from God, good books, blogs and friends. My passion is studying the women in the bible, because we don’t seem to hear much about them in sermons. I thought that someone should write a book with all the verses pertaining to women and children. Then it dawned on me that God wanted me to write it. I do love the women stories. There are so many things that Jesus did for women, but the most important one is that Jesus gave women a voice. This entry was posted in Catholic Abuse Stories and tagged Adele Hebert's Story, Catholic Spiritual Abuse, Every Woman and Child, Religious Abuse, Religious Survivor on June 3, 2013 by Religion's Cell.